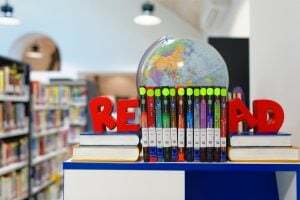 The ASA Library is a student-centered and friendly environment that offers resources and services to assist patrons in becoming life-long learners, critical thinkers and effective users of information. The resources, catalogued in a web-based system, include over 14,000 volumes, AV materials, chromebooks and Internet access available to the whole school community. We also subscribe to a variety of databases like BrainPop, JSTOR, Questia, Gale’s Opposing Viewpoint, Map as History, Archive History, and Churchill Archives that students and teachers, can access remotely to facilitate their academic and personal research. Elementary students enjoy a weekly visit with their class to check out books, read, practice information literacy skills and exercise digital citizenship. All other students are welcome to visit the library on their own. Parents are also encouraged to open an account and borrow books before or after school to read to their young children. This open access library is open from 7:30 to 4:00pm Monday to Friday but the library catalog and databases are accessible 24/7. For more information about the ASA Library, please contact us at library@asamadagascar.org.